Duchess the Doberman was allowed to remain with her owners after investigators said she showed no signs of abuse. Officials have determined that a rail-thin Doberman Pinscher whose photo went viral on Facebook was not in poor health and displayed no signs of abuse or neglect. 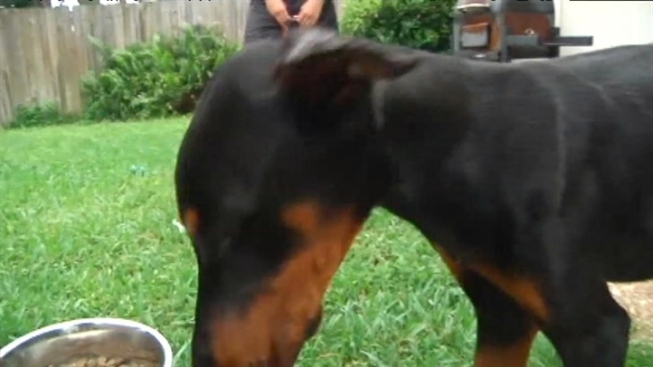 Fort Lauderdale Police Detectives and a Broward County Animal Control specialist went to owner D'Anthony Davis' home on the 1600 block of NE 17th Avenue Wednesday morning and found the 2-month-old Doberman, named Duchess, untethered in the back yard, according to Fort Lauderdale Police. Animal control said the dog was thin, but did not appear to be in poor health. A visit to the vet showed Duchess wasn't putting on weight because she had hookworm. "I think we just didn't know that she had hookworm, so it's not our fault," said Sherene Walker, Duchess' other owner. During the visit with investigators, Davis showed them a tub of high quality dog food and recent medical records, police said. The investigators did not see signs of abuse, worms, fleas or mange. Davis said the whole ordeal was a misunderstanding. Monday, August 26 is National Dog Day. Roxanne Vargas welcomed an expert from Petco to the 6 In the Mix set to talk about some great techniques both first time and long time owners can use to ensure a happy and healthy pooch. "I take care of my dog," he said. "I had dogs all my life. My parents taught me to take care of stuff I have... I wouldn't neglect the dog, because I think that's unfair to the dog." Davis said he put Duchess in time-out for a few hours Tuesday morning, but never neglected her. "She's a house dog," he said. "We had her outside because she had some discipline problems barking. She had plenty of food and water." Duchess gets fed three times a day, he said. The photo of Duchess was posted on Facebook by animal rights group 100+ Abandoned Dogs of Everglades Florida. It was shared more than 4,000 times and garnered more than 4,100 comments. A post on the group's Facebook page Wednesday afternoon said Duchess had been removed from the owners' home, but Fort Lauderdale Police said she was taken to a free check-up by the Animal Control vet and returned to her owners. Another puppy, a shepherd mix, was at the house, and investigators said it appeared to be in good health and well-nourished. Police said no further follow up on the dogs is necessary at this time and any further concerns should be addressed to Broward County Animal Control.